I am probably guilty also. I'm not too happy with the way New FamilySearch (NFS) prompts for sources. I stand among the ranks of those that have mostly put off entering my sources into New FamilySearch except in cases of well-established wrong information. In my presentation on new FamilySearch at the BYU Computerized Genealogy Conference in March 2008, there were a number of questions on notes and sources that I responded to. It appears that I have left the impression that we should not enter notes and sources at all. I would like to correct that notion. Entering notes and sources will be beneficial to all, at any time. While it is true that there will be improved ways of doing this in the future, it is always good to capture this information and share it with others. Entering it via GEDCOM could case duplication, that method of entry should be done cautiously and with discretion. The benefit of having them available and shared with everyone is great, hopefully greater than any inconvenience you would have in entering them manually, or reformatting them in the future. No data will be removed or lost, we go to great lengths to make sure of that, at all times. Last month, Genea-Musing's Randy Weaver did an article about the subdomains on Ancestry.com. Seaver gives excellent descriptions of what the different subdomains are used for. I thought I'd supplement his descriptions and add some subdomains that I've seen that weren't included in the list he got from Alexa. This is all public information. Anyone using Ancestry.com everyday for the past six years who keeps an eye on the browser addresses would know what I'm going to share here. I've only included the subdomains that are part of the Ancestry website, so while RootsWeb is included in Alexa's list (technically it now is a subdomain), I don't include it here. It's not part of the Ancestry website. End of story. Stop worrying. awt.ancestry.com - This is Ancestry World Tree (AWT), also available as RootsWeb World Connect. The bottom of http://awt.ancestry.com/cgi-bin/igm.cgi gives the current number of names, surnames and databases in AWT. awtc.ancestry.com - Funny you should ask about this one. If one tries to go directly to this subdomain, it automatically shuttles you over to AWT. The only way I have found to get to this subdomain is via One World Tree (OWT). When viewing an individual in OWT, click on the X User-submitted trees link. I can imagine that the "c" in awtc stands for constant or consistent or copy, since OWT needs a static copy of AWT to which it can link. Otherwise, all the links in OWT to AWT would break. blogs.ancestry.com - This subdomain is not part of the Ancestry website, but I'll mention it in passing. Its use is self-obvious. boards.ancestry.com - This is the message boards. comments.ancestry.com - This one's a really strange egg. I haven't seen any changes to this subdomain in the past 4 or 5 years so the branding isn't up to date and the functionality is not well integrated with the rest of the website. You can't get to this subdomain directly. To get there, you must view a record, select Comments and Corrections and then click on Add a Comment. Poking around, it starts to look and act a lot like the old message board system. community.ancestry.com - Some of the Ancestry Community pages have recently moved to this new subdomain. The new member profile pages are on the community subdomain. content.ancestry.com - This is another subdomain that you can't get to directly. It replaced the images.ancestry.com subdomain (see below). Currently, it hosts browsing and the image viewer. dna.ancestry.com - This is where DNA Ancestry lives. groups.ancestry.com - This is a new subdomain that sprang into being with the introduction of DNA Ancestry's DNA groups. images.ancestry.com - This subdomain is mostly dead. If I recall correctly, it served the same purpose as the content subdomain, which has replaced it. At least some old URLs to this subdomain can be handled by the content subdomain, which masquerades as the images subdomain when it can. landing.ancestry.com - I don't have a lot of public information about this domain. I've seen it used a lot for promotions. There doesn't seem to be any publicly known information to indicate why pages would be located here rather than on the main www subdomain. I noticed both the latest campaigns (www.ancestry.com/military and www.ancestry.com/nara) redirect to this subdomain. learn.ancestry.com - This is where the Learning Center resides. search.ancestry.com - This is where search results are presented. Because of the search form at the bottom of the Old Search's result pages, searches can be initiated from this subdomain. New Search lives here as well as Old Search. secure.ancestry.com - This is the subdomain used whenever the https protocol is needed. This is a change from the practice 3 or 4 years ago, when I used to see https traffic from the www subdomain. Https traffic is encrypted to protect passwords, personal and credit card information. As Seaver mentions, My Account resides on this subdomain. So does most of the Subscribe pages. When you log in, secure.ancestry.com is used transparently to keep the login safe. store.ancestry.com - The Ancestry Store is another subdomain that I'll mention in passing that is a website in its own right, with its own branding. trees.ancestry.com - This is where Ancestry Member Trees (aka Family Trees) live as well as One World Tree. www.ancestry.com or simply ancestry.com - See below. This is the big kahuna, the home base for Ancestry.com. The home page lives here—both of them! As long as I've been at Ancestry, there's been one home page used if no one is logged in, presumably a visitor or non-subscriber, and one for logged-in visitors, presumably subscribers or registered non-subscribers. Many searches start from this subdomain, either from a home page, a database page or a database group page. Each database potentially has a database page here, as we saw in the P.S. of an earlier post. However, as I clicked on the links of recently posted databases, I found that the www subdomain sent me to the content subdomain. I had to go back to 30-May-2008 before I found a database that stayed on the www subdomain. Ancestry has set up several groups of databases that can be searched all at once. These search pages are often located on the www subdomain. I found several examples on the home page: U.S. Census Records, Birth, Marriage & Death Records, and Immigration & Emigration Records. My Ancestry is on the www subdomain as well as the Ancestry Community pages that haven't yet moved over to the community.ancestry.com subdomain. A variety of other subdomains exist. Anybody with DNS knowledge can get an entire list from Ancestry's name server. (Note to self: nslookup/ set type=ns/ ancestry.com/ server ns1.myfamily.net/ set type=any/ ls ancestry.com) Here are some that apparently used to serve a useful purpose, but have perhaps been long ago forgotten with the change of personnel over the years. In general, Ancestry likes to keep ancient links working at least well enough to bring you to the Ancestry site. buick.ancestry.com - Used to go to the Buick contest page. It looked like this. Congratulations to fellow bloggers who mentioned winning prizes, Randy Seaver and Apple of Snowville. You owe me! census.ancestry.com - When Ancestry finished indexing all of the US Census, they created a special set of pages to celebrate. The root of this subdomain probably pointed to those pages. Incidentally, there's also pages for a previous Immigration marketing campaign. data.ancestry.com - Goes to search.ancestry.com. I'm not certain where it might have gone originally. plist.ancestry.com - Goes to search.ancestry.com. share.ancestry.com - Goes to a lavalife mobile promotion. ssdi.ancestry.com - Goes to search.ancestry.com. Might have originally gone to the Social Security Death Index search page. start.ancestry.com - Goes to a Getting Started page. win.ancestry.com - Same as the share.ancestry.com lavalife mobile promotion. Thanks, Randy, for your idea and original article. I totally planned on a 30-minute extension to your article. Somehow this grew into an 8 hour tour down memory lane. Whew! FamilySearch is taking steps to cancel the accounts of individuals that have signed up to do indexing, but have been inactive for some time. This includes those who signed up and then never did any indexing as well as those that have not done any indexing for some time. These individuals recently received an e-mail warning them that if they didn't do anything prior to 30-June-2008, their accounts would be deleted. We noticed that a FamilySearch Indexing account associated with this e-mail address has been inactive for at least nine months, or was created over three months ago and has never been used. We invite you to return to the FamilySearch Indexing Web site and try indexing again. Simply go to www.familysearchindexing.org and click the Start Indexing button. If you do not remember your username and password, click here to have it sent to your e-mail address. You may leave the username blank if you do not remember it. If you still cannot log in, please send an e-mail to indexing@familysearch.org and include your full name. We will send your username and a new password as soon as possible. If you no longer wish to participate in FamilySearch Indexing, you do not need to do anything. This account will be deleted on June 30, 2008, unless you log in before that date. If your account is deleted and you decide to start indexing again at a later date, you may register as a new volunteer on the FamilySearch Indexing Web site, www.familysearchindexing.org. Yesterday Ancestry "published" a fix for the Enhanced Image Viewer bug that has affected a lot of you. When the user tried to view an image the installation page would repeatedly reload. The bug only affected users with Ancestry Member Trees and (get this!) the longer the name of the tree, the more likely the user was to experience problems and the more frequently the problem reoccurred after users fixed the problem by deleting their cookies. To "get" yesterday's fix, go to one of your trees and view an individual. If that doesn't work, delete your cookies. You should then be able to use the enhanced image viewer without problems. Over the years, I've seen deleting cookies fix a variety of problems and this was one of them. If you ever find Ancestry.com acting extremely weird, see if deleting your cookies clears up the behavior. I'm one of those folks who one day could not use the image reader. Each time I tried to open an image, the page kept loading and reloading over and over... no way to view the image. So I wrote for help and received instructions advising me that there might be a conflict with my Norton. Well, since I didn't have Norton, I wrote again and got basically the same answer. I wrote again, and finally I had someone that read my query and sent me [a different answer]. ...Not a quick process, but after following each of the steps, it did work - for less than 2 days. I'm back where I was originally. Loading and reloading with IE and AOL. This has been going on for the last 3 weeks and I'm certainly not getting the benefit of my paid services. Do you have any suggestions? It's awful to think that I'd need to do each of these steps every other day. Are other people having the save problem? Any idea when this might be fixed? Could Ancestry have done a better job helping customers experiencing this problem? Sure. But you should realize how difficult that is. It is a rare customer service employee in medium or large companies that can recognize a program bug, so it's extremely unlikely that enough different reps will recognize the problem and log it in a consistent way that makes it possible to assess how prevalent a bug is. It is a rare product manager or software developer assigned enough time "eating their own dog food" to discover these issues themselves. It is a rare customer that can provide the necessary information to prove an issue is a bug and to give developers all they need to reproduce, diagnose and fix a bug. That's not a criticism. But unlike me, normal people don't browse with an http protocol sniffer program installed on their computers. This particular problem was especially mysterious because the program bug was undetectable when using the tree pages where the bug resided. A seemingly independent page of the website started to fail even though no changes had been made to that page. Nearly 100% of the time, that means an outside factor such as Norton or AOL made a change that caused the problem. When the problem happened to me the second time, I knew I hadn't made any changes in my system. I gathered all the information necessary for the developers to diagnose and fix this problem. But I couldn't have done it without information some of you supplied, either directly to me or in other public forums. Thank you! And thanks to the Ancestry people that worked with me to get this problem fixed. You're awesome! NFS Rollout Update: United States Phase 2 Milestone! I'm calling the rollout to Utah and Idaho, which will occur last, phase 3. That leaves everything in between as phase 2. Now the exciting milestone. Look at the map and you'll see there are no more red dots in the United States outside Utah and Idaho! All other U.S. temples have already started using NFS or are in the 4 month window! Phase 2 is completely in-process. Wahoo! FamilySearch publicly announces after temple districts have gone live. Before that, I can put them in the yellow—notified—category only if someone tells me or mentions it somewhere online. And it pretty much has to be in English too, or I may never hear about it. Keep that in mind as you look over the red dots in non-English speaking countries. Since most of Europe were notified early this year, I suspect they should start going live, even though I haven't heard anything yet. I haven't heard of any districts going live the week of 4-July-2008, so maybe FamilySearch employees get some time off. Plus there are 4 weeks in August that are unaccounted for. That's another 8 to 16 temples that could go live that I don't know about. But that's pure speculation on my part. If you have missionaries internationally, pass on what they know. I'm at AncestryInsider@gmail.com . I've recently added a cool new feature to my map. Hover over a dot and Internet Explorer will display the name of the temple. (Unfortunately, I just found out that this doesn't work in Firefox.) Thank you to those that suggested this improvement. I've added blinking to the temple districts that have changed since the last map (which was just last week). Wednesday and Thursday people usually start reporting in new notifications. Will this continue now that much of the English-speaking world has already been notified? Check back to see at Temple Districts Using New FamilySearch. I've seen a lot of pronouncements from some of you that you plan on sticking with Ancestry's old search. Unfortunately, it may not be around for too much longer. Given that you will be forced to the new search at some point, have you identified what needs to fixed, changed or improved? Did you provide that feedback? Ancestry is using a survey to evaluate New Search. Click the Tell us what you think link at the top of a New Search page to participate. Note that question 5 allows multiple responses. Please leave some comments here, as well. Intelligent comments, please. In my opinion, stupid comments damage the chance of getting things fixed or improved. I'll pass them on to the powers that be. Want some examples of intelligent comments? See Randy Seaver's this month and last. Lastly, come by my website and take part in a poll: Is New Search ready to replace Old Search? In our discussion with Gordon Clarke, we asked him what was to become of the old familysearch.org page. He matter of factly told us “It’ll be shut down, there will be no use for it because all of the information will be in the New Family Search.” He couldn’t be more wrong. Following Shoebox's complaint, other bloggers have rung in to voice their opposition to killing the old FamilySearch website. "This [issue] is of international concern," said Hugh Watkins, U.K. blogger. Genealogy's humor writer, Chris Dunham of The Genealogue blog, was all serious when he expressed concerns about broken links. "I hope they remember that FamilySearch is part of something larger than itself—a world wide web, to coin a phrase." See the entire post for more information. FamilySearch has released so little information about how "all of the information will be [moved to] the New FamilySearch," I think it a little premature to get too worked up. On the other hand, I'm glad people are proclaiming the potential pitfalls. One should never over-estimate vendor understanding of product utilization. The better the feedback given to a product manager, the better the decisions will be. This is not the first time Clarke has experienced a "near-death" experience from bloggers. Last September 2007 Renee Zamora reported that in Gordon Clarke's Northern Utah Genealogy Jamboree presentation "they confirmed that PAF is a dead animal." Since Clarke's presentation was in support of his actions to help out 3rd-party developers, some of which depend on PAF, it's a great irony that the sound-byte, "PAF is dead," overwhelmed the remainder of his message. To avoid this problem at the March 2008 BYU family history conferences, Clarke read a carefully crafted and approved statement on the future of PAF, which seemed designed to reassure PAF users and the 3rd-party developers constructing products dependent on it. This author reported that statement under the head line, "PAF is only mostly-dead," referencing Miracle Max from the movie Princess Bride. Miracle Max declares an apparently dead character as "only mostly-dead" and then proceeds to revive him. Hopefully Clarke's latest statement will not be reduced to "Old FamilySearch is Dead"—at least until we understand more about the patient's condition. Visitors to my website Wednesday afternoon may have been the first to see that Ancestry has posted 90+ new German databases. They also got to see an "oddity" of my Recent Databases widget. When a database is not in English, instead of presenting the title as the link to the database, the widget shows something like "(in German)". The illustration to the right shows one English database and two German databases. My story is that I wanted it to work that way, and I'm sticking to it. But I digress. I think the databases are city directories. Take a look for yourself. This will bore most of you. To create this blog entry, I cut and pasted the titles, above, from Ancestry's list of recent databases. I had to do a little formatting of the HTML and I made an interesting observation. The links for a lot of these titles were almost identical, sometimes incrementing the number at the end of the address by one, sometimes skipping a value and sometimes mixing up the sequence. That's all. I told you it would be boring to most of you. Source: FamilySearch. © IRI, Inc.
FamilySearch is testing the possibility of conducting online training of its family history consultants. The training is titled, "Helping Family History Happen." A maximum of 200 participants will be allowed to participate in this test. The training is scheduled to take place Monday, 30-June-2008. It will start at 11:00 AM MDT and last for approximately 90 minutes. The test will use Adobe's Acrobat Connect Pro software which requires a high-speed Internet connection (DSL or cable), a supported version of Flash Player, a clear connection to the training website and installation of Acrobat Connect software on your computer. the E-Learning Courses available to registered consultants at lds.netdimensions.com. Family History Consultants are encouraged to register at http://consultant.familysearch.org so that training materials and opportunities are available to you. If you have registered before but are not receiving regular e-mails for consultants, check your Junk/spam e-mail folder and re-register. Registering more than once does no harm and can be used to update any of your information, such as your e-mail address or calling. The State Library of Iowa reports three libraries have been seriously damaged: Cedar Rapids Public Library's main building in downtown; the National Czech and Slovak Museum and Library, located in the Czech Village in Cedar Rapids; and the New Hartford Public Library. The damage to the CRPL is being assessed. A professional “recovery team” has already conducted a walk-through. It’s estimated that the water rose approximately five feet up the first floor. The book shelves are intact and not all were completely under water. However, we are not optimistic about saving anything on the first floor. The humidity, muck, and air quality are taking their toll. Books on the upper shelves did not get wet. A lot of the library's collection was saved. New Hartford did not fare as well. Water destroyed 4,600 books, leaving only 1,000. They lost 5 computers. Only one library board member can help the library's one employee because the other board members lost their homes in the earlier tornado. The public library in Des Moines has been turned into the city's emergency crisis center. The mayor, city council, essential city departments and 170 employees have set up. The city's television station has been broadcasting from inside the library as well. Seven libraries have suffered mild to serious water damage: Chelsea, Creston, Elkader, Iowa Falls, Rockford, St. Charles, and Waterloo. Libraries have often become "hubs" for flood refugees trying to find information, see pictures of their homes, check e-mail, use copy machines, etc. Some libraries have added additional computers. Others have extended hours. "Sometimes our biggest job is just listening to people's stories," reported Llewann Bryant, Keck Memorial Library, Wapello. There are reports of several inches of water in the basement of the University of Iowa Main Library in Iowa City, but flood waters did not reach the library. Volunteers came out in droves to help save books, forming a "bucket brigade" to move books to higher floors. Nancy Baker, head librarian made a public plea on the radio and hundreds of people from the university and community responded, hour after hour. Boxes of manuscripts from the basement were among the items saved. Lynn Blumenstein and Norman Oder, "Flooding in Cedar Rapids, IA, Inundates Libraries," LibraryJournal.com, 19-June-2008, accessed 19-June-2008. "Iowa Libraries in Flood Time. No. 6.15.2008. 100." Librarian.lishost.org, 15-June-2008, accessed 19-June-2008. "Reports Coming in from Iowa Libraries Affected by Flooding," StateLibraryOfIowa.org, Last modified 19-June-2008 3:25 PM, accessed 19-June-2008. The FamilySearch Indexing project helps point to information on old handwriting styles by the Genealogical Society of Finland. I didn't find the writing samples helpful for 1800s American records. In particular, there is a form of lowercase e called an "open E". It looks like an uppercase E, but has the height of a lowercase character. To see some examples, let's look at the two words from last week. Separating each letter from the others, it is a little easier to see the name "Emeline." The first E is, of course, capitalized. Once separated from the M, the second E is obviously an Open E. The last letter is debatable, but since Emeline is a recognized given name and Emelim is not, it is likely the last letter is an E and probably an Open E at that. The second word is also shown below, separated into its individual letters. Knowing about the Open E makes it easy to see the surname "McKenzie." Note that the penman used both a regular E and an Open E in the same name. Does anybody know if there was a rule explaining when each was used? Did you get Emeline and McKenzie as your answers last week? A search of Federal District Court filings and dockets reveals that The Generations Network (TGN) filed a complaint Monday against Millennia and BTH2 alleging trademark infringement. Millennia is the maker of Legacy Family Tree, a desktop genealogy program that competes against TGN's Family Tree Maker (FTM). Millennia recently released Legacy 7.0. Co-defendant, BTH2 (or BTHtwo), is a branding and creative design agency located in Orem, Utah. According to their website, BTH2 did the Family Tree Maker (FTM) 2008 brand design for TGN. The Ancestry Insider obtained a copy of the complaint from the U.S. District Court for the District of Utah. TGN alleges that BTH2 became a manufacturer, publisher and distributor for Legacy 7.0, redesigning the Legacy box to look remarkably similar to the design BTH2 did for TGN. TGN alleges the similarities are intentional and deceptive. BTH2 provided these services to Millenia in violation of its contract with TGN not to provide similar services to competitors for a year, according to the TGN complaint. A white and orange color scheme with dark text and similarly colored text. Italicized black text across the top. Use of the orange leaf as the dominant graphical element. The words FAMILY TREE in large, dark sans-serif text as the dominant text element on the front and sides of the box. An orange colored, script text element immediately above FAMILY TREE. Three photographs on top of the leaf/leaves, the top one in color and the other two in sepia tone. Bulleted lines of italic text underneath the word FAMILY containing the words "easily", "create" and "charts" in that order. The phrase "build your family tree." Orange graphic elements anchoring the designs on the sides of the box. The complaint also points out similarities between the Legacy website header and artwork from the movie Legacy: A Mormon Journey. The movie debuted in 1990 in the newly-opened 500-seat Legacy Theater in the Joseph Smith Memorial Building in Salt Lake City. In the same building and near the entrance to the theater is a FamilySearch Family History Center. Patrons to the center are in the target market for Millennia's Legacy program. The complaint shows Legacy media labels were not using the script logo prior to 1997. The Internet Archive for www.legacyfamilytree.com shows the sunset graphic didn't come into use by Millennia until after 1998. The Generations Network (TGN) confirms it has begun legal proceedings against Millennia Corporation, publisher of Legacy family history software, and BTH2 Inc., the apparent designer of Legacy’s family history software packaging and a re-publisher/distributor of that software. TGN has concluded that Legacy’s software packaging, currently available at retail, clearly violates TGN’s trademark of its Family Tree Maker product and is designed to resemble our trade dress (the look and feel of our branding), in a way that has and will continue to confuse consumers. Since this is an ongoing legal issue, TGN has no further statement at this time. FamilySearch Labs employee Dan Lawyer shared a concept on his blog being considered for New FamilySearch. Imagine you'd like to know who in your tree has been updated recently, or who has multiple parents, or who has sources, etc., etc. You could define a scope of interest for example assume I'm working on my Brewster line. I go over to Sarah Augusta Brewster and tell the system I want to define a scope of interest starting at Sarah and going back 5 generations and down 2 generations at each generation. The system would then report to me about activity in this portion of the tree. But don't get your hopes up. Lawyer explained this is just a concept being considered. You can imagine how useful this would be to keep tabs on people in the tree and see who is updating them. Before you get too excited about this, remember, this was just a quick demo we hacked together to show the concept. It is not ready for prime time. The Record Search pilot has added 72 million new names to its Mexico Baptism collection online. The collection was transcribed from Mexico parish records dating from 1659 to 1905, and is not necessarily complete for any particular place or region. It also includes records from the Middle America Vital Records Index—Mexico that was published in 1999 on CD only. The newly expanded database can be searched for free at http://pilot.familysearch.org. The data was transcribed by FamilySearch's impressive force of volunteer indexers worldwide. 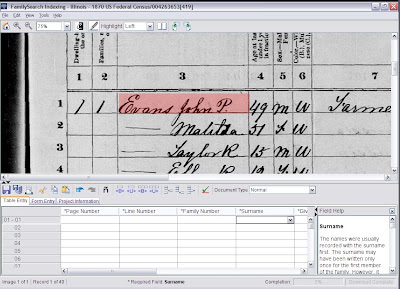 Volunteers donate a little time each week or month transcribing select information from digital images of original source documents using FamilySearch's online indexing utility. Anyone interested in joining the global, community-based indexing initiative, or wanting to see what projects are currently being indexed, can do so at www.familysearchindexing.org. The significance of another change to the New FamilySearch home page may be lost to those unfamiliar with beliefs of FamilySearch's owner, the Church of Jesus Christ of Latter-day Saints. Recently, the photograph and quote of Gordon B. Hinckley, the Church's immediate past president, were changed to a quote and photograph of Thomas S. Monson, current Church president. This change will gradually be repeated in hundreds of instances, in hundreds of media, but for only one reason. So this elementary website change reflects the Church's deep, foundational belief that God has chosen a new prophet to serve as His mouthpiece to His children on the earth. A notice on https://new.familysearch.org warns that the New FamilySearch website will be down 29 June 2008 and 30 June 2008. "Maintenance" is the reason given. Speaking of websites being down, I understand that Ancestry's newspaper collection was down for part of the afternoon yesterday, 16 June 2008. And speaking of notices on websites, the old FamilySearch website is sporting a new addition. This little puppy shown to the right links to the FamilySearch Record Search pilot website. I'm no expert. I could be wrong. But this might be an example of what happens when a programmer implements a quick and dirty user interface element without input from a designer. I'm speaking here as much to myself as anyone else. But here's a word of advice to programmers out there: copy. You don't have to have a lick of design sense if you take a moment to look at the rest of the page (assuming a designer designed it). Yes, chiseling looks cool and may look better (to you and me) than the anemic shadows sported by the pictures on this page. But you're just going to have to trust me when I say we techies see the world differently than normal people. Now a word about color. We're not only techies, we're male. I'm not saying we're better or worse than other people. But you'll have to trust me when I say that fully saturated colors appeal more to super heroes than the general public. If there is no available female to ask about a color choice, I've found moderate success in sampling one of the colors already used on the page, switching it to HLS, and varying the hue. Keeping the saturation and lightness values the same as designer-chosen colors on the page will usually give a color that fits reasonably well with the rest of the page. Michael De Groote, writer for the Mormon Times section of the Deseret News, contacted me last week while he wrote a story about the rollout of New FamilySearch. Groote's story was published online yesterday. The title of the article? "Rolling out TempleReady Online." Groote also spoke with Paul Nauta, FamilySearch public affairs manager. Nauta mentions some confusion over the term, "New FamilySearch." Remember when we first heard about "Common Pedigree?" Remember when we were told that the name was being changed to "new FamilySearch" with a lowercase "n"? Recently I've noticed FamilySearch Labs using the term "Family Tree". From Nauta's comments, it seems this name change is, indeed, occurring. The new process [being rolled out] is temporarily being called "TempleReady Online" after the more complicated, older "TempleReady" desktop computer program. ... But there has been some confusion. Because FamilySearch, the LDS Church's genealogy brand, is working on several projects, some people have mistakenly thought the rollout of TempleReady Online is the totality of the "new FamilySearch." New FamilySearch is going to be a wiki, a new search engine, an indexing program which allows us to index records worldwide and an online family tree—where people will actually be able to add, manage and share their family history online in real time, kind of like a desktop program but without all the bells and jingles. Those are all different features and benefits that are coming under what we call the new vision of FamilySearch. TempleReady Online is just a function of Family Tree. Family Tree is described as an alternative to PAF, not a replacement. "People will still be able to use PAF if they wish to do so," said Nauta. Although FamilySearch has no official list or published schedule of the rollout, an un-official map at the Ancestry Insider blog keeps track of TempleReady Online's implementation. Thank you, Michael. It is an honor to be mentioned. Sorry I've taken so long to inform you; there's still several days to take advantage of this free offer. Here's the full announcement from Ancestry.com. For a more comprehensive list of new titles, see my previous report, Ancestry Boosts Newspaper Collection. We doubled the size of our historical newspaper collection - adding a billion names and 20 million images. Different than census or other types of records, newspapers can add context through breaking news, gossip columns, entertainment listings, advertisements and much more. As we dug into the collection, we found stories of local town heroes - such as an article from 1909 in the Syracuse Herald about Patrolman Brunn who rushed in front of a speeding subway train to save a man who had fallen from the platform. We found medicinal cures, including pickled bee stings for rheumatism, described in a 1904 edition of the Washington Post. We found stories of how folks back then made ends meet, like the widows described in one 1909 Sheboygan Press article who could purchase the entire city of Chicago with their fortunes. Now through June 19th, you can search our entire historical newspaper collection free. Check out our newspaper collection and see what interesting stories you can discover! I notice several dozen libraries in Florida offer real-time chat with librarians. (Ask a Librarian -- Florida's Virtual Reference Service) If Florida does it, maybe other libraries of interest to you do it too. Here's an idea. If you have a quick genealogical lookup request, try out real-time chat with a librarian. You signed up to receive news and updates about the upcoming World Archives Project. We’re excited to announce that we’re officially kicking off the project. We invite you to watch this brief video that captures the true meaning behind this exciting new undertaking. Ancestry will create digital images of archive records as the first step in the project. Volunteers who transcribe the records using Ancestry's indexing tool. Ancestry will then create an index and publish it free to everyone. We began alpha testing the World Archives Project in May and we’ve planned beta testing for July. When beta testing begins, you’ll be one of the first people invited to try the new World Archives Project tool. Look out for an email from us in July. Visitors may still sign up for notifications about the project at http://landing.ancestry.com/keyingtool/notify.aspx , where the possibility of helping with the beta test is also mentioned. 5-March-2008 - Word of the Ancestry World Archives Project first became public via a post on the Ancestry sponsored 24-7 Family History Circle blog. 18-March-2008 - Ancestry president, Tim Sullivan, mentions the project during his BYU genealogy conference keynote, as reported here. 21-April-2008 - Internally announced to employees (see this post). All Generations Network Utah employees began testing the keying tool. 29-April-2008 - T-shirts with the project name are spotted in Provo; reported here. May-2008 - Began alpha testing, according to the 12-June e-mail. 12-June-2008 - Ancestry sent out an e-mail announcing the upcoming beta test. July-2008 - Planned start of beta testing, according to the e-mail. With Ancestry's announcement yesterday, I can now fill in most of the blanks in my original post of 21-April-2008. "Account for all the bumps" is a shorthand way of saying that all the bumps, strokes and dots could theoretically match the letters you have in mind. As you try to figure out what a word or name might be, try and account for all the bumps. Different letters have a different number of bumps. A lowercase m has 3 while n has 2. Lowercase u, v, x, y also have 2. Sometimes lowercase a and o appear to have 2. Lowercase e, i, j, l, r, s and t all have 1 bump. Often, there isn't a lot of difference among some letters. My point is, if the bumps don't fit, you must a... er... you must reconsider. Let's look at an example. The word in the illustration below gave me problems. Put a check mark in front of each of the following choices that you think account for all the bumps. Don't worry that these aren't real words. Einsbin — I think so, assuming there's no dot on the first i and that is sb in the middle. It's a stretch, but all the bumps are accounted for. Enelein — I don't think so; this leaves an extra bump in the first half of the word. Euirlim — The r in the middle would have to be pretty sloppy, but yes, I think Euirlim accounts for all the bumps. Emeliur — That E in the middle would be pretty unusual, but if you're right, then this one works. Which of the following account for all the bumps. Again, don't worry that these aren't real words. M@Kemir — While you've accounted for all the "bumps" above the baseline, I don't think you've accounted for the descending loop. McKeizir — No, I think you've got too many bumps in your z. In closing, "account for all the bumps" is really just a shorthand way of saying that all the bumps, strokes and dots could theoretically match the letters you have in mind. So, what do you think the two words are? Leave me a comment with your answer. Next week I'll give my answers. Stayed tuned. Ancestry World Tree is not included in the "new Ancestry Search" list. I wonder why? Is it because it is associated with Rootsweb and is now accessible only through Rootsweb...? You're in the ball park. However, there is no plan (that I'm aware of) to make AWT accessible only through RootsWeb. While you're aware of the connection between AWT and RootsWeb, for our readers that don't, let me explain that AWT is nothing more than a re-branding of RootsWeb's WorldConnect technology, which Ancestry acquired when it bought RootsWeb. As a result, AWT data is not stored in an Ancestry search-system database. Back in the days when Ancestry had no tree technology of their own, adding special code to the search results to show the number of matches in AWT had a large benefit. But while the presentation looks integrated, giving AWT result counts in old search is smoke and mirrors. When you start to drill down, you quickly get shunted from http://search.ancestry.com off to http://awt.ancestry.com, which runs on RootsWeb technology. I say "old search" but it's really "old-old-old search." We were 3-generations back in our search technology in those days. That was before new search, before the dread 4-tab search (internally called "bucket search") and before ranked search. Back then, all searches were exact. Searching across multiple databases never gave a list of ranked records but always gave the number of matches in each category. As a consequence, smoke and mirrors integration of AWT into the search technology was straight-forward and low cost. If you think about it, you'll notice that AWT results have never been integrated into any of the new technologies. The ranked (non-exact) search technology has never shown AWT records mixed among the Ancestry search system records. Neither does non-exact bucket search. Since New Search is still in preview, might AWT results be added? At least to the category results page?That depends on Ancestry users. At the top of the page, New Search Preview sports a link labeled Tell Us What You Think. You won't be heard if you don't say anything.